Scallops are cute round delicious seafood. Need I say more? Well OK. 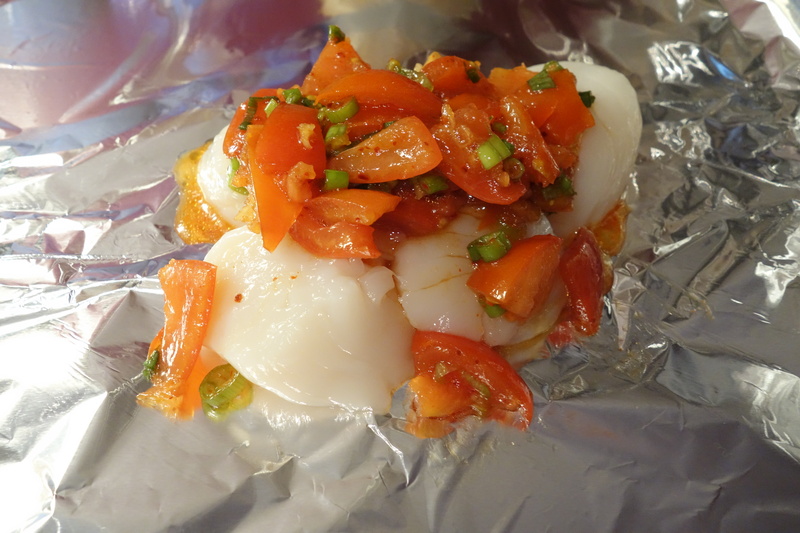 Here is a scallop primer for total beginners (because I was one, too). There are lots of places giving detailed tips on purchasing scallops, so definitely Google it for more deets, but here are my quick tips. Get DRY scallops. This means they are not soaked in brine or water, which is a cheapo way of keeping them preserved, AND increases their weight so you pay more for less. Disapprove. There are SEA scallops and BAY scallops. Bay scallops are freshwater, sea scallops are seawater, so sea scallops are naturally saltier. Keep this in mind when seasoning your food. Get the big ones (size of a poker chip or larger), not the tiny ones (size of a pencil eraser). They are different types, and my research said the tiny ones can be rubbery. It seems most recipes are for the big ones anyway. Rinse them well. They can be gritty. And obviously like any seafood, make them right away once you buy them! 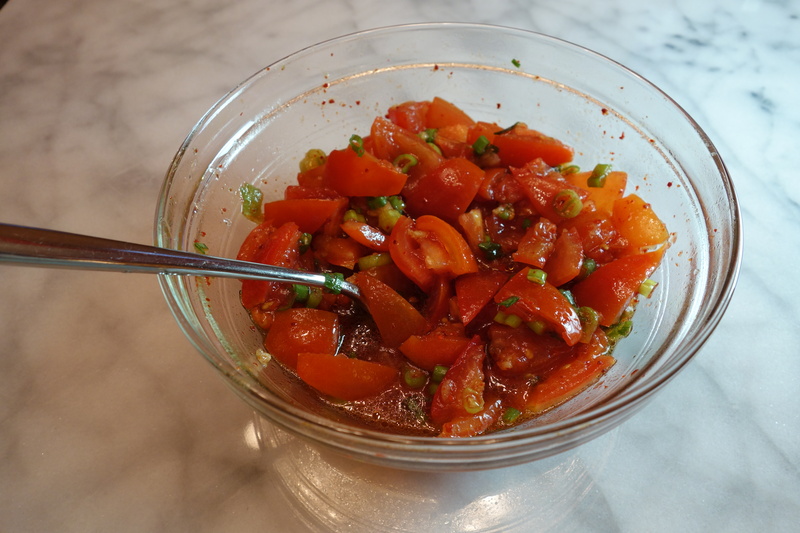 In a medium bowl, mix the chopped tomatoes, red pepper flakes, garlic, green onion, sesame oil, canola or peanut oil, and tamari. Place two large squares of aluminum foil on a flat surface (counter or tabletop). Spoon 1/2 the scallops on each (4-5 scallops). Top with 1/2 the tomato mixture. To create the packets: Lift opposite (parallel) sides of foil and bring them together at the top. Fold over 1/2 inch, then 1/2 inch more at top to create a seal (but still leave room for the fish and tomatoes). For remaining ends, fold each over 1/2 inch, then 1/2 inch more to create a sealed packet. Repeat for other foil square. Place both packets in small casserole or pie plate (in case they leak). Bake at 450 degrees F for 20-25 minutes. To check for doneness, pierce packet with knife and make sure scallops are cooked through (opaque white rather than translucent). 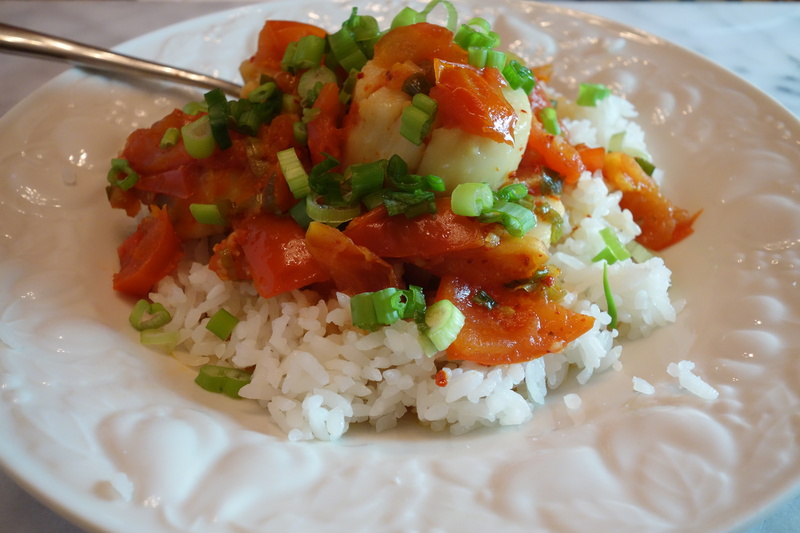 I like to serve this over rice since it is very saucy, with additional sliced green onions on top. You could also serve it over greens. Enjoy! This is a radish*rose original recipe, inspired by Fish: Complete Guide to Buying and Cooking by Mark Bittman. All images & content are copyright protected. All rights reserved. Please do not use my images without prior permission. If you want to republish a recipe, please credit radish*rose and link back to the recipe.